Rawlings was very proud and excited after the event. “I was very surprised who won, it is was the first time for both of them and they happened to be in my class.” Rawlings said. “Everything went as planned, this was our eighth time hosting this event so we were pretty much prepared and we couldn’t do it without the students’ help. 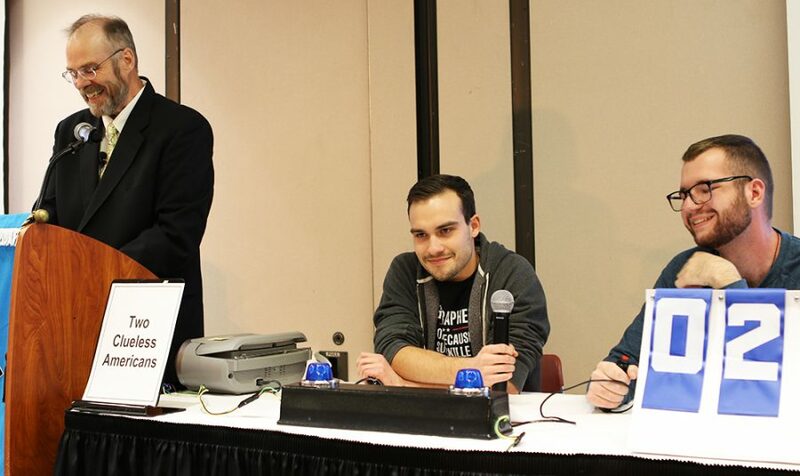 We had student assistants and other faculty members helping out, it was a team effort.’’ Photo ourtesy of Randy Bertolas Two Clueless Americans were one of the eight teams the participated in geography bowl on Thursday. Wayne State College hosted its eighth annual geography bowl on Nov. 1, in the Frey suites. The geography bowl is an activity held in honor of the geography awareness week, designated as the third week in November. Wayne State college geography professor Lesli Rawlings organized the quiz while Dr. Randy Bertolas was the master of ceremonies for the event. The geography bowl quiz had groups who participated and battled against each other in a knock out round. The questions varied from geography questions, big ten football questions, college questions and some political science questions. A group of three juries was available to help Bertolas confirm if the answers were right or wrong. Extra Credit is Nice, Two Clueless Americans, No Country for Old Men, Djibouti Kickers, Carry a Big Stick, Team 2, Boot Gang and Prestige Worldwide, were the names of the groups of this year. The last two mentioned groups, Boot Gang and Prestige Worldwide made it to the finale, where Boot Gang won after a three rounds. Bertolas said that in the eight years Wayne State has hosted this event, this is the first time that a final third round was needed to decide the winner. The winners, Nick Gligorevic and Mika Williams, are the first freshmen who have won the geography bowl. During the breaks of the quiz, the audience could also win prizes. Upon entering, the audience received a raffle ticket, and if they had the four lucky numbers, they could pick out prizes like Wildcats t-shirts, inflatable globes, pencils and much more. Rawlings was very proud and excited after the event.